WPA ammunition is a great way to get you out on the range without breaking the bank. These new production 7.62x39 rounds are loaded into berdan primed steel cases that are not re-loadable. Each projectile in this box of 20 is a 125 grain soft point that is bi-metal and will stick to a magnet. 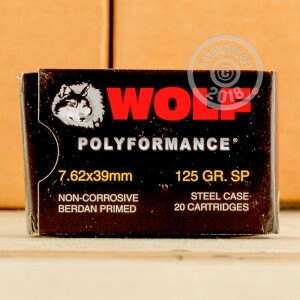 The Polyformance line from Wolf features a polymer coating on the casings in order to promote positive chambering and extraction in today's semi-automatics. 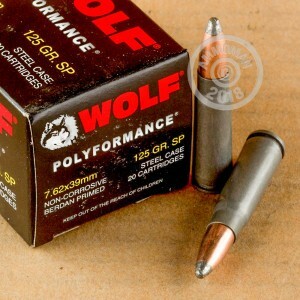 This ammo is non-corrosive and economical. 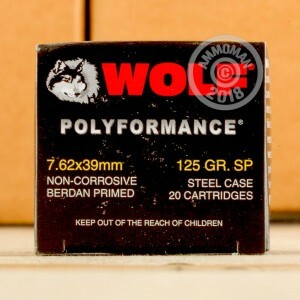 Wolf Performance Ammunition has earned a reputation for being both rugged and affordable, perfect for volume shooting at the range. WPA is a trademark associated with Sporting Supplies International, who is a major importer of foreign ammo. Most of the steel cased ammunition with the WPA brand name is manufactured in the famous Tula Cartridge Works factory located in Tula, Russia. Do you need more than a couple boxes? At AmmoMan.com all orders over $99 will receive Free Shipping! So stock up and save more!